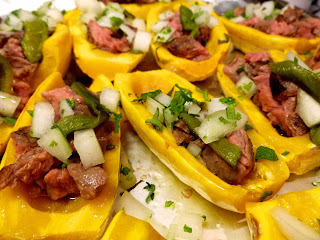 Delicata squash have taken over my seasonal taste buds for the moment. This squash ranges in size and for this particular rendition I used the smallest ones I could find. I got these from Paradise Valley Produce at the Thursday San Rafael Civic Center Market. Last week I put sloppy joe filling in them and Steve commented that I should really try to do a "taco" version as he was just picking them up whole and taking huge bites out of the entire combo. The kids really liked them too, I thought they might balk at eating the skin, but once they tried it they cleaned their plates. This flavor profile is really different to me. Not particularly sweet, just the right amount of heat and a very clean feeling after you eat them. I'm not sure it will please everyone but after the excesses of Thanksgiving it was a nice break. There's not a ton of cooking time, the bulk of the work is actually in the prep. I had "leftovers" with this quantity, actually looking forward to trying it the next day to see if the flavors settled in any kind of exciting way, but alas, Steve struck before he went to bed and when I went to try them the next day they were a distant memory. Rub the skirt steak with the garlic on all sides and season with salt and pepper. Leave out on counter and let come to room temp while getting everything else ready. Turn on grill to high or oven to broil and roast peppers until blackened all over (If using the grill get your oven going to preheat to 375 as well). Put roasted peppers in a glass bowl and cover, or in a plastic ziploc, to allow to steam on their own--turn oven down to 375 if you need to. While peppers are going, start prepping the squash. Wash the squash well and cut off stem ends and slice lengthwise. Scoop out the seeds and set them cut side up in whatever pan you are roasting them in. Drizzle then brush all squash with olive oil. Sprinkle half the sage on to the squash along with salt and pepper and put in oven for 20 min. or until tender when pierced with fork. Assemble your "taco". I did chopped steak first, a slice of poblano and a spoon of sage onion cilantro mix. Very delicious! Place the radishes in a colander in the sink and toss with salt. Let rest for 15 minutes to extract some of the water. Mix the sesame oil, honey, vinegar, lemon juice and garlic in a bowl and set aside. Rinse the radishes and dry with a paper towel. Add the radishes to the pickling mixture you created. 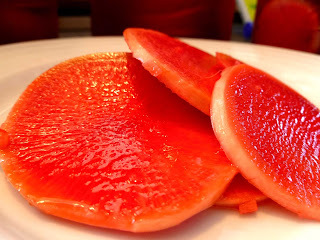 Place into a Ball jar and let marinate at least 1 hour. Refrigerate to store. Lasts up to 1 month. Yes, in all caps! RIBS! These are pretty easy to pull together, it just takes some time in the oven. If you are watching the sugar intake, do these without BBQ sauce, they taste amazing without it, but you can add your own favorite if you want at the end--I get that ribs are not ribs without all the goop for some of you. I have a good BBQ sauce recipe from Nourishing Traditions that's easy to pull together and avoids all the additives you find in the commercial brands. I got my ribs from Marin Sun Farms and they were soooo good. Other good resources here in the Bay Area are from Prather Ranch or Fallon Hills, or Tara Firma Farms. I used pork spare ribs this time out, but you can use baby backs too. 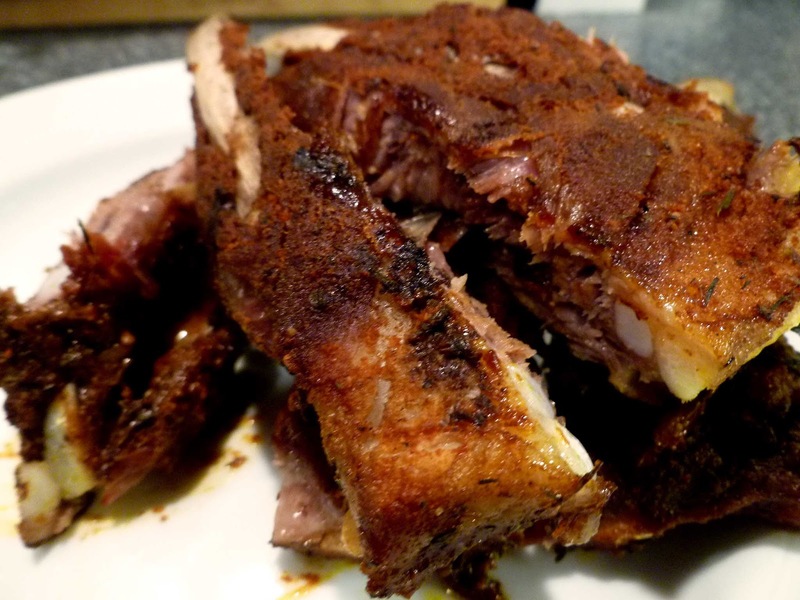 You can also do this recipe with beef ribs, they typically do not have as much meat on them and tend to be a tad bit tougher, but they are less expensive than pork ribs. I pulled this recipe from Emeril Lagasse and scaled it back a bit so I didn't have a ton of extra spice rub--original recipe here. I also didn't use the grill at all, just did everything in the oven to keep things simple. One more thing about the spices. In 2010 there were a couple of bad salmonella outbreaks from imported spices and while I haven't seen any news about repeat problems, better to be safe than sorry. Please try to use all organic spices and ones that are made and processed here in the US, the FDA has pretty strict guidelines and can (somewhat) enforce them here. Blend all ingredients in a small bowl, leftovers can be stored in an airtight container for a couple of weeks. I use it for my "taco seasoning" when we do ground beef tacos. This rub has lots of heat in it--feel free to dial back the cayenne and paprika if you don't like things too spicy. Preheat a grill to medium-high (or a 300 degree oven). Remove the ribs from the oven and peel back the foil so that the ribs are exposed. Using a pastry brush or the back of a spoon, coat the racks lightly on the meaty sides with the barbecue sauce. Place the slabs of ribs, meaty side up, on the grill and cook until the barbecue sauce is thickened and lightly browned, 5 to 10 minutes. Alternatively, return to the oven until sauce is thickened and lightly browned, about 20 minutes longer. Remove the ribs from the grill (or the oven) and set aside to cool briefly before cutting between the ribs and serving. Serve with more barbecue sauce, if desired.